Benefits of sport include; socialising and interacting with others, creating a feeling of inclusion, keeping fit and healthy and the release of endorphins, and empowerment through participating in something that provides enjoyment and a sense of achievement through personal bests. Barriers to Sport can be categorised into 3 Groups: Physical, Logistical, Psychological. Can include facilities that are inaccessible for people with a disability, or where adaptive equipment is necessary but costly. Relate to support from families to attend or ability of others to use manual handling equipment and often there are limited times for when disability sport is available. Include both the perception of self and the attitude of others. A lack of confidence or self-esteem can prevent people with a disability people from considering participation in sporting activity, especially when coupled with a lack of awareness of available opportunities. The same can be said for the child’s support network. A fear of ‘health and safety’ may make facilities dismiss inclusion sport, and a focus on changing these attitudes is required. Verschuren et al (2012) explored in greater detail facilitators and barriers to participation in sport and physical activity for children and young persons with Cerebral Palsy . 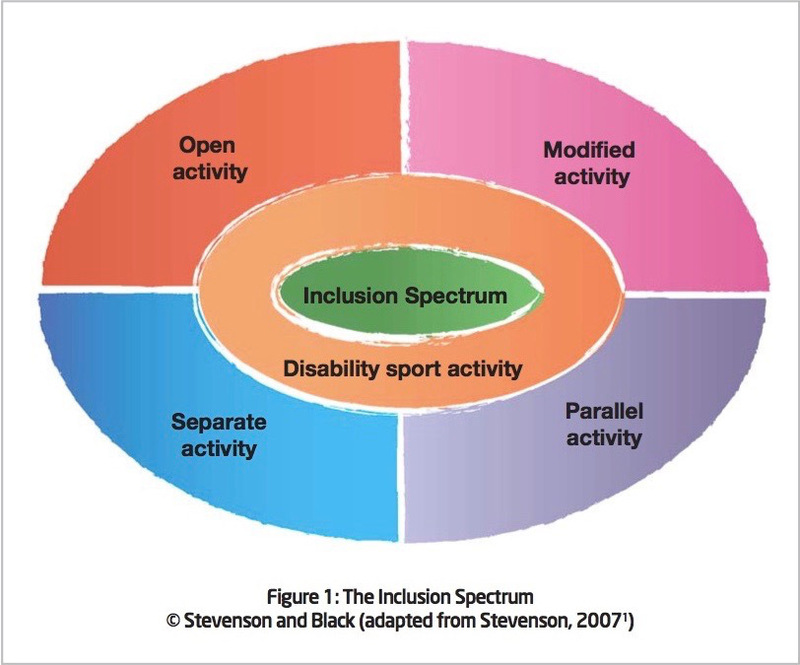 The Inclusion Spectrum is a model for inclusion in physical education and sport to aid those involved in sport understand how to include people with a disability in sports. It includes five approaches selected according to the needs of the person with a disability aimed at empowering all participants, including both those with and without a disability . 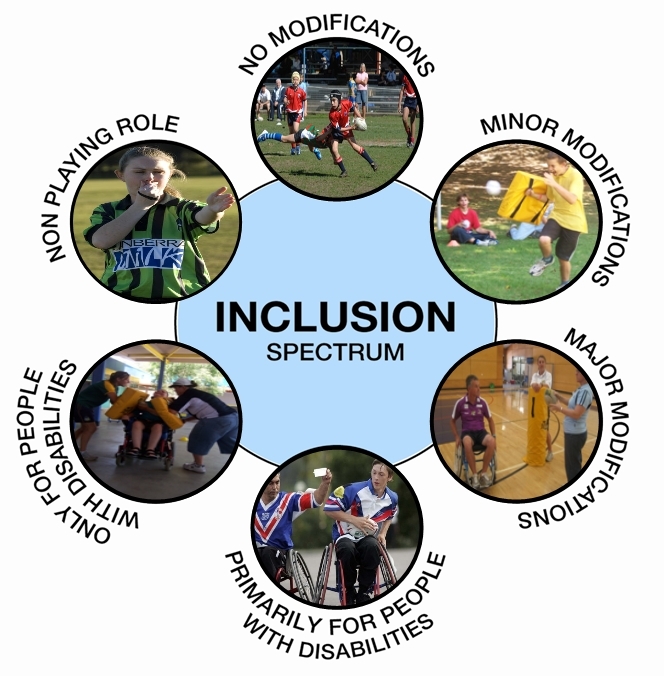 Everyone in a group of differing abilities complete the same activities set at the least able people in the group with little or no modifications. Members of the group complete the same activity but in different ways according to their abilities. Modifications are made using the STEP model. When everyone completes the same activity but participants are grouped with people with the same level of ability. If an activity is totally unsuitable for an individual or group, then they complete a different activity. For further information on Inclusion in Sport for people with a disability you can read SportCoachUK Quick Guide to Inclusive Coaching. Verschuren et al (2007)  completed a randomised controlled trial with 86 children comparing the effect of aerobic and anaerobic circuit training against a control group. Exercise capacity was significantly increased in the training group. Additionally, they demonstrated improvements in agility, muscle strength, self-perception of athletic competence and participation level. Quality of life also improved; measured with the Health Related Quality of Life Questionnaire, Motor, Autonomy and Cognition Domains all improved. Dodd et al (2002)  completed a systematic review of the effectiveness of strength training for people with Cerebral Palsy and found that strength-training programs increase the muscle strength of children and young adults with Cerebral Palsy. In addition, this was in the absence of adverse effects such as increased spasticity. Cerebral Palsy Sport is the United Kingdom National Disability Sport Organisation (NDSO) for Cerebral Palsy, whose vision is to support people with Cerebral Palsy to reach their life potential through sport and active recreation. They promote and support inclusion of people with Cerebral Palsy and related neurological conditions, including children, young people and adults, to participate in sports including football, swimming, athletics, bowls, table cricket and adapted sports. They also offer support for parents, families, carers, therapists, teachers, coaches and other professionals on how to adapt sports and recreational activities for people with Cerebral Palsy. ↑ Verschuren O, Wiart L, Hermans D, Ketelaar M. Identification of facilitators and barriers to physical activity in children and adolescents with cerebral palsy. The journal of pediatrics. 2012 Sep 30;161(3):488-94. ↑ Verschuren, O., Ketelaar, M., Gorter, J.W., Helders, P.J., Uiterwaal, C.S. and Takken, T., 2007. Exercise training program in children and adolescents with cerebral palsy: a randomized controlled trial. Archives of pediatrics & adolescent medicine, 161(11): 1075-1081. ↑ Dodd, K.J., Taylor, N.F. and Damiano, D.L., 2002. A systematic review of the effectiveness of strength-training programs for people with cerebral palsy. Archives of physical medicine and rehabilitation, 83(8): 1157-1164.